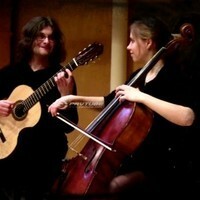 It always makes us happy to see and hear our music being performed, and we recently discovered several arrangements by Klas Krantz performed on YouTube by the stellar cello and guitar duo TenStrings. Ten Strings are an exciting new Scottish duo consisting of Royal Conservatoire of Scotland graduates Iain Coleman and Jackie Baxter. Together, they have performed numerous times at the Royal Conservatoire of Scotland, including at the prestigous Big Guitar Weekend, and are regularly in demand for weddings, functions and musical societies, as well as for other corporate events and ceremonies throughout Scotland. Have a look at some of their performances - you're sure to be inspired!